Broadwater II was part of a larger compound of cottage style houses on the neck of the Magothy River. “It was important to blend the architectural aesthetics and detailing with the established cottage style homes in the neighborhood,” said architect Scarlett Breeding. “We wanted the new home to flow seamlessly into the garden and its surroundings to maintain a connection with the outdoors.” Gables connected each structure, so in order to preserve the purity of the gable forms in the cottage-like structure, a transparent material was needed. 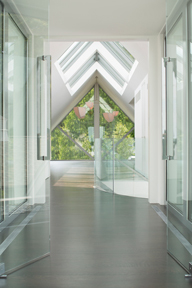 Even with the modern design and all the glass, the house creates a feeling that’s warm, friendly and inviting. John Alt and Scarlett Breeding opened their architectural practice in 1987 with the goal of providing a new level of distinctive residential and commercial design services in the Chesapeake Bay region. Jay Schwarz, a practicing architect in the Annapolis-Baltimore area since 1978, joined the firm in 1997. 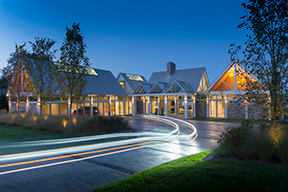 Since the merger, they have completed over $900 million in new construction and adaptive re-use projects which have received numerous design awards and recognition. Backed by a talented staff of eleven architects, interior and kitchen designers, each principal contributes a unique and special set of skills, resulting in a surprising range of design solutions and project services. Jay is a leading expert in guiding projects through the often difficult process of permits and approvals, and is lead principal for commercial project construction documents, LEED certifications, and large-building construction management. John is the concept designer for many projects in their formative stages, and also takes the lead on large-scale planning efforts. Scarlett is the principal-in-charge for residential, interior design, kitchens, custom cabinetwork, and commercial interiors. Under her leadership, ABS has become one of the most highly regarded—and comprehensive—residential design services on the East Coast.